නැමීබියාව(Namibia) ( i/nəˈmɪbiə/, /næˈʔ/), හෙවත් නැමීබියා ජනරජය( Republic of Namibia) (German: Republik Namibia (උදවු·තොරතුරු); Afrikaans: Republiek van Namibië ),බටහිරින් අත්ලාන්තික් සාගරයටත් උතුරින් සැමිබියාව හා අැංගෝලාවටත් නැගෙනහිරින් බොස්ට්වානාවටත් දකුණින් දකුණු අප්‍රිකාවටත් මායිම්ව අප්‍රිකාණු මද්වීපයේ පිහිටි ජනරජයකි.නැමීබියාව1990 මාර්තු මස 21 වන දිනෙන් පසු දකුණු අප්‍රිකාවෙන් වෙන්වී වෙනම ස්වාධීන රාජ්‍යයක් ලෙස ගොඩනැගිණි.මෙහි අගනුවර වින්ඩෙක් නගරයයි.නැමීබියාවඑක්සත් ජාතීන්ගේ සංවිධානයේ හා දකුණු අප්‍රිකා සංවර්ධන සංවිධානයේ(SADC) සාමාජිකයෙකි.මීට අමතරව පොදුරාජ්‍ය මණ්ඩලයේද සමාජිකත්වය දරයි.නැම්බියාවේ වර්ථමාන නායකයා ආචාර්‍ය හේග් ගෙන්බොග්ය (Dr. Hage Geingob). නැමීබියාෙව් වියලි කලාපයෙහි අතීතෙය් දී සැන් දම්රා සහ නාමා වරුන් වාසය කළෝය.14 වන සියවසයේ සිට බන්ටු ජනයා මේ පෙදෙස්වලට සංක්‍රමණය විය.19 වන ශත වර්ෂය දක්වා බන්ටු හා හිම්බා ජනතාව මෙහි ජනගහනයෙන් බහුතරය විය. 19 වන සියවසයේදී නැමීබියාව ජ්ර්මනියට අයත් යටත් විජිතයක්ව පැවතිණ .මෙම තත්වය 1915 දක්වා පැවතින.දකුණු අප්‍රිකා හමුදාව ජර්මන් හමුදාව පරාජය කිරීමත් පළමුවන ලොක යුද්ධය අවසන් වීමත් මෙයට හේතුවිය.1920 දී ජාතීන්ගේ සංගමය මගින් මෙය දකුණු අප්‍රිකාව යටතටත් පවරන ලදී. 20 වන ශතවර්ෂයේ සිට නැමීබියාව දකුණු අප්‍රිකාවට අයත් භූමියක්ක ලෙස පැවතින.කෙසේ වෙතත් මෙය වෙනම රාජ්්‍යයක් ලෙස ස්ථාපිත කරනමෙන් නැමීබියාවේ වාසය කල බහුතරයවූ ඔවැම්බෝ ජාතිකයන්ගේ සතය විය.පසුව 1990 දී නැමීබියාව දකුණු අප්‍රිකාවෙන් වෙන්වූ වෙනම රාජ්‍යයක් ලෙ ස්ථාපනය විය.මෙසේ නැමීබියාව වෙනම රාජ්‍යයක් ලෙස ස්ථාපනය වීමට එවක මෙම භූමියේ වාසයකල ජනයාගේ ඉල්ලීම් අනුව සිදුවිය.කෙසේ වෙතත් වර්තමානසේ නැමීබියාවට අයත් පෙන්ගුවින් දූපත 1994 දක්වා දකුණු අප්‍රිකාවට අයත්ව තිබිණ. නැමීබියාවේ ජනගහනය මිලියන 2.1 පමණය.නැමීබියා ජනරජයේ පහු පක්ෂ පාර්ලිමේන්තු ප්‍රජාතන්ත්‍රවාදී පාලන ක්‍රමයක් පවතී.කෘෂීකර්මය,පශු පාලනය,සංචාරක ව්‍යාපාරය සහ පතල් කර්මාන්තය ප්‍රධාන වශයෙන් දියමන්ති කැණීම,යුරේනියම,රන්,රිදී,සහ ලෝහ නිස්සාරණය ඔවුන්ගේ ආර්ථිකය සවිමත් කරයි.මෙහි ලොව විශාලතම කාන්තාරයක්වූ නැමීබි කාන්තාරය පිහිටා ඇත. නැමීබියාවට මෙම නම ලැබෙන්නේ ලොව පැරණිතම කාන්තාරය ලෙස සැළකෙන නැමීබි කාන්තාරය මෙහි පිහිටා ඇති නිසාය. නිදහසට පෙර නිරිතදිග අප්‍රිකාව ලෙස හැදින්විය.නිරිතදිග අප්‍රිකාව ජර්මානු යටත් විජිතයක් ලෙසද පසුව දකුණු අප්‍රිකාවටද අයත්ව තිබිණ. (දකුණු අප්‍රිකාවද මහා බ්‍රිතාන්‍යයට අයත් යටත් විජිතයක්ව පැවතිණ). අතීතයේ සිටම නැමීබියාව ජනාවාසව පැවතියේය,සැන් දමාරා නාමාවරුන්ගේ වාසස්ථන මෙහි පිහිටියේය.14 වන සියවසයේ සිට මධ්‍යම අප්‍රිකාවේ සිට පැමිණි බන්ටු ජාතිකයෝ නැමීබියාවේ පදිංචිවිය.18 වන ශතවර්ෂයෙන් පසු ඔරැන්ගේ නදිය තරණය කරමින් පැමිණි ඔලෑම්වරු දකුණු නැමිබියවේ ජනාවාස ඇතිකරගත්හ. මොවුන් නාමාවරු සමග සමගිව වාසය කළහ.එසෙම මිෂනාරීන්ට එක්විය,ඔවුන්ට ජලමූලාශ පරිහරණය කිරීමේ අයිතිය හා තෘණ භූමි පරිහරණය කිරීමේ අයිතිය ලැබිණ. යුරෝපා ජාතීන් ලෙස මුල්වරට නැමීබියාවට ගොඩබසින්නේ පෘතුගීසි ජාතිකයන්ය.1485 දී දියෙගෝ කවෝ නම් පෘතිගීසි ජාතික නැවියා හා 1486 දී බාටොලොමෙවු ඩයස් නම් නැවියාද නැමිබියාවට ගොඩබසින ලදී. එහෙත් පෘතුගීසින් කිසිවිට නැමීබියාව යටත් කරගැනීමට උස්සාහ නොකළේය. අනෙකුත් සහරා උප කාන්තාර ප්‍රදේශ මෙන් නැමීබියාවද 19 වන සියවස දක්වා සම්පූර්ණයෙන්ම යටත් කරගැනීමට යුරෝපා ජාතීන්ට නොහැකිවිය. 19 වන සියවසයේ දී නැමීබියාවට පැමිණි ජර්මන් හා ස්වීඩන් වෙළදුන් ගෙන් ඩෝස්ලන්ඩ් ටෙකර් නම් නැවියා නැබ්බියාවේ පදිංචිවිය. නැමීබියාව 1884 දී ජර්මානු යටත් විජිතයක් බවට පත්විය.එකල මෙය ජර්මානු නිරිතදිග අප්‍රිකාව නමින් හැදින්විය. කෙසේ වෙතත් කේප් ටවුනහි බ්‍රිතාන්‍ය අණ්ඩුකාරවරයා විසින් මෙහි නැමීබියාව ස්වභාවික වරාය ඇතුලු ඇතැම් කොටස් නැමීබියාවේ ප්‍රදේශ කිහිපයක් බ්‍රිතාන්‍යයන් යටත් කර ගත්තේය. 1904 සිට 1907 දක්වා කාලය තුල හිරෙරෝ හා නමකුවා ජර්මනියට විරුද්ධව සටන් වැදුනි. ජර්මානු දධිරාජ විසින් ඔවුන් ජනඝාතකයන් ලෙස සළකා දඩුවම් පමුණුවනු ලැබීය. මෙම යුද්ධයේ දී නාමාවරු 10,000 පමණ සමූල ඝාතනයට ලක්විය. මෙම යුද්ධ අවසානයේ 1948 දී නැමීබියාව දකුණු අප්‍රිකාවට අයිතිවිය. දකුණු අප්‍රිකා නිදහස් සටනේ දී බොහෝ අප්‍රිකානු ස්වදේශිකයන් ජර්මානු හුමදා අතින් සමූල ඝාතනයට ලක්විය. කෙසේ වෙතත් නැමීබියාව තුල සිදුවූ මහා ජන සංහාරයන්ට ජර්මානු රජය විසින් නැමීබියානු වැසියන්ගේන් 2004 වසරේ දී නිල වශයෙන් සමාව අයැදීය. ජර්මන් හමුදාව 1915 දී පළමුවන ලෝක යුද්ධයෙන් පරාජයවීමත් සමග දකුණු අප්‍රිකාවේ පාලනයට නැමීබියාව ලක්විය. It administered it from 1919 onward as a League of Nations mandate territory (nominally under the British Crown). Although the South African government wanted to annex 'South-West Africa' into its official territory, it never did so. But, it administered the territory as its de facto 'fifth province.' The white minority of South-West Africa elected representatives to the whites-only Parliament of South Africa. They also elected their own local administration, the SWA Legislative Assembly. The South African government appointed the SWA administrator, who had extensive executive powers. Following the League's replacement by the United Nations in 1946, South Africa refused to surrender its earlier mandate. The UN intended that it be replaced by a United Nations Trusteeship agreement, requiring closer international monitoring of the territory's administration and a definite schedule to achieve independence of Namibia. After the rise of the National Party in South Africa, it established apartheid in both areas. The Herero Chief's Council submitted a number of petitions to the UN in the 1950s calling for it to grant Namibia independence but was not successful. During the 1960s, as European powers such as France and the United Kingdom granted independence to some colonies and trust territories in Africa, pressure mounted on South Africa to do so in Namibia. In 1966 the International Court of Justice dismissed a complaint brought by Ethiopia and Liberia against South Africa's continued presence in the territory, but the U.N. General Assembly subsequently revoked South Africa's mandate. South Africa continued to exercise de facto rule while SWAPO expanded its guerrilla efforts to end that. In 1971 the International Court of Justice issued an "advisory opinion" declaring South Africa's continued administration to be illegal. In response to the 1966 ruling by the International Court of Justice, South-West Africa People's Organisation (SWAPO) military wing, People's Liberation Army of Namibia, a guerrilla group began their armed struggle for independence. It was not until 1988 that South Africa agreed to end its occupation of Namibia, in accordance with a UN peace plan for the entire region. ජර්මානු හා දකුණු අප්‍රිකානු පාලන සමය තුල සුදු ජාතික වානිජ වගාකරුවන් නැම්බියාවට පැමිණියහ.ඔවුන් වගාකලහැකි සරුබිම්කඩවල් තම පාලනයට නතුකර ගත්හ.. නැම්බියාවේ වානිජ නගර කර්මාන්තශාලා ඛනිජ නිධි හා වගාකලහැකි සරුබිම් බොහෝමයක් දකුණු නැම්බියාවට අයත්වේ.නැම්බියාවේ උතුරු කොටස තුල මෙහි ස්වදේශිකයන්වූ ආදිවාසීන් වාසය කරති. South West Africa was formally recognised as Namibia by the UN; the General Assembly changed the territory's name by Resolution 2372 (XXII) of 12 June 1968. In 1978 the UN Security Council passed UN Resolution 435, which laid out a plan for transition toward independence for Namibia. Attempts to persuade South Africa to agree to the plan's implementation were not successful until 1988, after years of warfare. The transition to independence finally started under a diplomatic agreement between South Africa, Angola and Cuba, with the USSR and the USA as observers. Under this, South Africa agreed to withdraw and demobilise its forces in Namibia. As a result, Cuba agreed to pull back its troops in southern Angola, who were sent to support the MPLA in its war for control of Angola against UNITA. Angola also resolved its civil war. A combined UN civilian and peace-keeping force called UNTAG (United Nations Transition Assistance Group), led by Finnish diplomat Martti Ahtisaari, was deployed from April 1989 to March 1990 to monitor the peace process and elections, and to supervise military withdrawals. As UNTAG began to deploy peacekeepers, military observers, police, and political workers, hostilities were briefly renewed on the day the transition process was supposed to begin. After a new round of negotiations, a second date was set, and the elections process began in earnest. After the return of more than 46,000 SWAPO exiles, Namibia's first one-person one-vote elections for the constitutional assembly took place in November 1989. The official election slogan was "Free and Fair Elections". This was won by SWAPO although it did not gain the two-thirds majority it had hoped for; the South African-backed Democratic Turnhalle Alliance (DTA) became the official opposition. The elections were peaceful and declared free and fair. Since independence Namibia has successfully completed the transition from white minority apartheid rule to parliamentary democracy. Multiparty democracy was introduced and has been maintained, with local, regional and national elections held regularly. Several registered political parties are active and represented in the National Assembly, although the SWAPO has won every election since independence. The transition from the 15-year rule of President Sam Nujoma to his successor Hifikepunye Pohamba in 2005 went smoothly. Since independence, the Namibian government has promoted a policy of national reconciliation. It issued an amnesty for those who had fought on either side during the liberation war. The civil war in Angola spilled over and adversely affected Namibians living in the north of the country. In 1998, Namibia Defence Force (NDF) troops were sent to the Democratic Republic of the Congo as part of a Southern African Development Community (SADC) contingent. In 1999, the national government successfully quashed a secessionist attempt in the northeastern Caprivi Strip. The Caprivi conflict was initiated by the Caprivi Liberation Army (CLA), a rebel group led by Mishake Muyongo. It wanted the Caprivi Strip to secede in order to form its own society. Shaded relief map of Namibia. Namibia map of Köppen climate classification. වර්ග කිලෝ මීටර් 825,615 km2 (318,772 sq mi), විශාලත්වයකින් යුත් නැමීබියාව වීශාලත්වයෙන් ලොව 34 වන රජ්‍යයයි. දකුණු අක්ෂාංශ 17° සහ 29° අතර සහ නැගෙනහිර දේශාංශ 11° හා 26° අතර නැමීබියාව පිහිටා ඇත..
නැමීබියාව කලහාරී කාන්තාරය හා නැමීබි කාන්තාරයට මයිම්ව පිහිටා ඇත, ඉතාම අඩු වාර්ෂික වර්ෂාපතනයක් ලැබෙන උප සහරා අප්‍රිකානු කලාපයට අයත්ව පිහිටා ඇත. නැමීබියාව ප්‍රධාන වශයෙන් භූගෝලිය කලාප පහකට බෙදේ,ඒවා මෙසේය මධ්‍යම සානුව,නැම්බි කාන්තාරය, මහා බෑවුම,බෘෂ්වෙල් සහ කලහාරී කාන්තාරය. සෑම කලාපයකටම කාන්තාරීකරණය වූ භූමි ප්‍රදේශ හමුවේ.නැමීබි මෙන්ම කලහාරී කාන්තාරයන්ට අයත් භූමි ප්‍රදේශ නැමීබියාව අයත්ය. මධ්‍යම සානුව නැමිබියාවේ උතුරේ සිට දකුණට විහිදී යයි.නිරිත දිග කලාපයේ නැමීබි කාන්තාරයට අයත් තැනිබිම් වලින් සමන්විතය.ඔරේන්ජ් රිවර් හෙවත් තැඹිළි නදිය දකුණු දිගින් පිහිටයි.කලහාරී කාන්තාරය නැගෙනහිර දේශ සීමාවේ පිහිටා ඇත.මධ්‍යම සානුව නැමීබියාව උස් භූමි වලට අයත්වන අතර එහි උසම කොටසේ උස මුහුදු මට්ටමේ සිට මීටර් 2606 හෙවත් අඩි 8550 කින් සමන්විතය. නැම්බියාවේ ජනගහණයෙන් වැඩිම කොටසක් මෙම මධ්‍යම සානු පෙදෙසේ වෙසෙයි.මෙම ප්‍රදේශ සාරවත් පසකින් යුක්තය කෘෂිකර්මය ජීවනෝපාය කරගත් බොහෝ නැම්බියානුවන් මෙම කලාපයේ වාසය කරයි.මෙහි උෂ්ණත්වය ග්‍රීෂ්ම ඍතුවේදී 40° C ඉක්මවයි. The Namib Desert is a broad expanse of hyper-arid gravel plains and dunes that stretches along Namibia's entire coastline. It varies between 100 and many hundreds of kilometres in width. Areas within the Namib include the Skeleton Coast and the Kaokoveld in the north and the extensive Namib Sand Sea along the central coast. The Great Escarpment swiftly rises to over 2,000 metres (6,562 ft). Average temperatures and temperature ranges increase further inland from the cold Atlantic waters, while the lingering coastal fogs slowly diminish. Although the area is rocky with poorly developed soils, it is significantly more productive than the Namib Desert. As summer winds are forced over the Escarpment, moisture is extracted as precipitation. 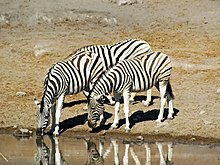 The Bushveld is found in north-eastern Namibia along the Angolan border and in the Caprivi Strip. The area receives a significantly greater amount of precipitation than the rest of the country, averaging around 400 mm (15.7 in) per year. The area is generally flat and the soils sandy, limiting their ability to retain water and support agriculture. The Kalahari Desert, an arid region that extends into South Africa and Botswana, is one of Namibia's well-known geographical features. The Kalahari, while popularly known as a desert, has a variety of localised environments, including some verdant and technically non-desert areas. 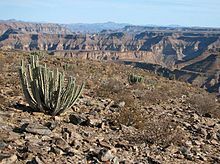 The Succulent Karoo is home to over 5,000 species of plants, nearly half of them endemic; approximately 10 percent of the world's succulents are found in the Karoo. The reason behind this high productivity and endemism may be the relatively stable nature of precipitation. Namibia's Coastal Desert is one of the oldest deserts in the world. 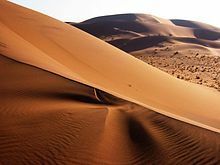 Its sand dunes, created by the strong onshore winds, are the highest in the world. Because of the location of the shoreline, at the point where the Atlantic's cold water reaches Africa's hot climate, often extremely dense fog forms along the coast. Near the coast there are areas where the dunes are vegetated with hammocks. Namibia has rich coastal and marine resources that remain largely unexplored. Namibia extends from 17°S to 25°S: climatically the range of the sub-Tropical High Pressure Belt. Its overall climate description is arid, descending from the Sub-Humid (mean rain above 500 mm) through Semi-Arid between 300 and 500 mm (embracing most of the waterless Kalahari) and Arid from 150 to 300 mm (these three regions are inland from the western escarpment) to the Hyper-Arid coastal plain with less than a 100 mm mean. Temperature maxima are limited by the overall elevation of the entire region: only in the far south, Warmbad for instance, are mid-40 °C maxima recorded. Typically the sub-Tropical High Pressure Belt, with frequent clear skies, provides more than 300 days of sunshine per year. It is situated at the southern edge of the tropics; the Tropic of Capricorn cuts the country about in half. The winter (June – August) is generally dry. Both rainy seasons occur in summer: the small rainy season between September and November, the big one between February and April. Humidity is low, and average rainfall varies from almost zero in the coastal desert to more than 600 mm in the Caprivi Strip. Rainfall is highly variable, and droughts are common. The last[update] bad rainy season with rainfall far below the annual average occurred in summer 2006/07.
) occurs, a hot dry wind blowing from the inland to the coast. As the area behind the coast is a desert, these winds can develop into sand storms, leaving sand deposits in the Atlantic Ocean that are visible on satellite images. The Central Plateau and Kalahari areas have wide diurnal temperature ranges of up to 30 °C. Efundja, the annual seasonal flooding of the northern parts of the country, often causes not only damage to infrastructure but loss of life. The rains that cause these floods originate in Angola, flow into Namibia's Cuvelai basin, and fill the oshanas (Oshiwambo: flood plains) there. The worst floods so far[update] occurred in March 2011 and displaced 21,000 people. නැමීබියාව යනු ලෝකයේ වියලිම බිම් අතරින් එකකි.මෙහි වාර්ෂික වර්ෂාපතනය මිලිමීටර් 350 පමණය.මෙහි වැඩිම වර්ෂාපතනයක් වාර්තාවන ගිනිකොණ දිග ප්‍රදේශයේ වාර්ෂික වර්ෂාපතනය මිලි මීටර් 600 පමණය.මෙමගින් නැමීබියාව යනු කොතරම් වියලි හා ජලය හිඟ භූමියක්ද යන්න තේරුම්ගත හැකිය.නැමීබියාවේ දක්නට ලැබෙන මුළු වර්ෂය පුරා ජලය පවතින එකම ගංගාව හමුවන්නේද දකුණු අප්‍රිකා දේශසීමාව තුලය,මෙම ගංගාව වැසි සමයේදී පිටාර ගලා යයිˌඑබැවින් ගංගාව අසල ජනාවාස පිහිටුවා නැත.බොහෝ දෙනකුට ගංගා ජලය වෙනුවට භූගත ජලය කෙරෙහි විශ්වාසය තැබීමට සිදුවේ.කෘෂිකර්මය පතල් කර්මාන්තය සංචාරක කර්මාන්තය සදහා යොදා ගන්නා ජලයෙන් 80% ක්ම භූගත ජලයයි..
Namibia is one of few countries in the world to specifically address conservation and protection of natural resources in its constitution. 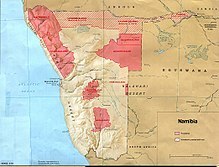 Article 95 states, "The State shall actively promote and maintain the welfare of the people by adopting international policies aimed at the following: maintenance of ecosystems, essential ecological processes, and biological diversity of Namibia, and utilisation of living natural resources on a sustainable basis for the benefit of all Namibians, both present and future." In 1993, the newly formed government of Namibia received funding from the United States Agency for International Development (USAID) through its Living in a Finite Environment (LIFE) Project. The Ministry of Environment and Tourism, with the financial support from organisations such as USAID, Endangered Wildlife Trust, WWF, and Canadian Ambassador's Fund, together form a Community Based Natural Resource Management (CBNRM) support structure. The main goal of this project is promote sustainable natural resource management by giving local communities rights to wildlife management and tourism. නැම්බියාව ස්වාධීන හා ඒකීය ප්‍රජාතන්ත්‍රවාදී රාජ්‍යයකි. මෙරට ජනාධිපතිවරයා වසර පහකට පත්වේ.ජනාධිපතිවරයා රජ්‍ය නායකයා ලෙස පිළිගනී. කෙසේ වෙතත් ජනපති සතු විධායක බලතල බෙදීයාමක් දැකගත හැක.අගමැතිවරයෙකු හා කැබිනට් මණ්ඩලයටද විධායක බලතල බෙදීයයි. විධායකය: විධායක බලතල ජනාධිපති අගමැති ප්‍රමුඛ කැබිනට් මණ්ඩලයට පැවරී ඇත.උප ජනාධිපති හා උප අගමැතිවරයෙක්ද සිටී. ව්‍යවස්ථාදායකය: නැම්බියා පාර්ළිමේනුත්ව කොටස් දෙකකට බෙදේ ඒ ඉහළ මන්ත්‍රී මණ්ඩලය හා පහළ මන්ත්‍රී මණ්ඩලය වශයෙනි..
අධිකරණය: අධිකරණය ප්‍රධාන කොටස් දෙකකි.ශේෂ්ඨාධිකරණය,මහාධිකරණ හා පහළ උසාවි වශයෙන් අධිකරණ ආයතන 3කි. Namibia follows a largely independent foreign policy, with persisting affiliations with states that aided the independence struggle, including Cuba. With a small army and a fragile economy, the Namibian Government's principal foreign policy concern is developing strengthened ties within the Southern African region. A dynamic member of the Southern African Development Community, Namibia is a vocal advocate for greater regional integration. Namibia became the 160th member of the UN on 23 April 1990. On its independence it became the fiftieth member of the Commonwealth of Nations. Namibia does not have any enemies[තහවුරු කරන්න] in the region but consistently spends more as a percentage of GDP on its military than all of its neighbours, except Angola. Military expenditure rose from 2.7% of GDP in 2000 to 3.7% in 2009, and the arrival of 12 Chengdu J-7 Airguard jets in 2006 and 2008 made Namibia for a short time one of the top arms importers in Sub-Saharan Africa. By 2015, military expenditure was estimated at between 4% and 5% of GDP. The constitution of Namibia defined the role of the military as "defending the territory and national interests." Namibia formed the Namibian Defence Force (NDF), comprising former enemies in a 23-year bush war: the People's Liberation Army of Namibia (PLAN) and South West African Territorial Force (SWATF). The British formulated the plan for integrating these forces and began training the NDF, which consists of a small headquarters and five battalions. The United Nations Transitional Assistance Group (UNTAG)'s Kenyan infantry battalion remained in Namibia for three months after independence to help train the NDF and to stabilise the north. According to the Namibian Defence Ministry, enlistments of both men and women will number no more than 7,500. නැමීබියාව ප්‍රාන්ත 14 බෙදී පවතීන අතර ඡන්ද කොට්ඨාශ 121 පමණ පවතී. The administrative division of Namibia is tabled by Delimitation Commissions and accepted or declined by the National Assembly. Since state foundation four Delimitation Commissions have delivered their work, the last one in 2013 under the chairmanship of Judge Alfred Siboleka. Regional councillors are directly elected through secret ballots (regional elections) by the inhabitants of their constituencies. Local authorities in Namibia can be in the form of municipalities (either Part 1 or Part 2 municipalities), town councils or villages. Namibia's economy is tied closely to South Africa's due to their shared history. The largest economic sectors are mining (10.4% of the gross domestic product in 2009), agriculture (5.0%), manufacturing (13.5%), and tourism. Namibia has a highly developed banking sector with modern infrastructure, such as online banking and cellphone banking. The Bank of Namibia (BoN) is the central bank of Namibia responsible for performing all other functions ordinarily performed by a central bank. There are four BoN authorised commercial banks in Namibia: Bank Windhoek, First National Bank, Nedbank and Standard Bank. According to the Namibia Labour Force Survey Report 2012, conducted by the Namibia Statistics Agency, the country's unemployment rate is 27.4%. "Strict unemployment" (people actively seeking a full-time job) stood at 20.2% in 2000, 21.9% in 2004 and spiraled to 29.4% in 2008. Under a broader definition (including people that have given up searching for employment) unemployment rose to 36.7% in 2004. This estimate considers people in the informal economy as employed. Labour and Social Welfare Minister Immanuel Ngatjizeko praised the 2008 study as "by far superior in scope and quality to any that has been available previously", but its methodology has also received criticism. In 2004 a labour act was passed to protect people from job discrimination stemming from pregnancy and HIV/AIDS status. In early 2010 the Government tender board announced that "henceforth 100 per cent of all unskilled and semi-skilled labour must be sourced, without exception, from within Namibia". In 2013, global business and financial news provider, Bloomberg, named Namibia the top emerging market economy in Africa and the 13th best in the world. Only four African countries made the Top 20 Emerging Markets list in the March 2013 issue of Bloomberg Markets magazine, and Namibia was rated ahead of Morocco (19th), South Africa (15th) and Zambia (14th). Worldwide, Namibia also fared better than Hungary, Brazil and Mexico. Bloomberg Markets magazine ranked the top 20 based on more than a dozen criteria. The data came from Bloomberg's own financial-market statistics, IMF forecasts and the World Bank. The countries were also rated on areas of particular interest to foreign investors: the ease of doing business, the perceived level of corruption and economic freedom. In order to attract foreign investment, the government has made improvement in reducing red tape resulted from excessive government regulations making the country one of the least bureaucratic places to do business in the region. However, facilitation payments are occasionally demanded by customs due to cumbersome and costly customs procedures. Namibia is also classified as an Upper Middle Income country by the World Bank, and ranks 87th out of 185 economies in terms of ease of doing business. The cost of living in Namibia is relatively high because most of the goods including cereals need to be imported. Business monopoly in some sectors causes higher profit bookings and further raising of prices. [තහවුරු කරන්න] Its capital city, Windhoek is currently ranked as the 150th most expensive place in the world for expatriates to live. Taxation in Namibia includes personal income tax, which is applicable to total taxable income of an individual and all individuals are taxed at progressive marginal rates over a series of income brackets. The value added tax (VAT) is applicable to most of the commodities and services. 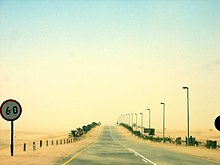 The B2 between Swakopmund and Walvis Bay, Namibia. Despite the remote nature of much of the country, Namibia has seaports, airports, highways, and railways (narrow-gauge). The country seeks to become a regional transportation hub; it has an important seaport and several landlocked neighbours. The Central Plateau already serves as a transportation corridor from the more densely populated north to South Africa, the source of four-fifths of Namibia's imports. Welcoming sign of the Burgsdorf farm in Hardap. නැමීබියාවේ ජනගහනයෙන් භාගයක්ම කෘෂිකර්මය තම ජීවනෝපාය කරගෙන සිටී .ස්වං පොෂිත කෘෂිකර්මයක් පවතින රාජ්‍යයක් වුවද ඇතැම් ආහාර ද්‍රව්‍ය ඔවුන්ට විදේශ රටවලින් ආනයනය කරගැනීමට සිදුවී ඇත.අනෙකුත් අප්‍රිකානු රාජ්‍යයන් මෙන්ම නැම්බියාවද ඌන සංවර්ධිත රාජ්‍යයක් ලෙස සැළකේ.ජනගහනයෙන් වැඩි කොටසක් ග්‍රාමීය පෙදෙස්වල වාසය කරති.නාගරිකරණය අවමය.ඒක පුද්ගල ආදායම ඉතා අවම අගයක් ගනී.ජාතික ආදයමෙන් වැඩි ප්‍රමාණයක් ප්‍රාථමික නිෂ්පාදන ඇසුරෙන් ලබාගනී.අවම යටිතල පහසුකම් ඇති යැපුම් කෘෂිකර්මය මත රඳා පවතින අතර වානිජ බෝග වගාව අවමය.නැම්බියා ජනගහනයෙන් හරි අඩකගේ පමණ ප්‍රධාන ආදායම් මාර්ගය කෘෂිකර්මයයි. About 4,000, mostly white, commercial farmers own almost half of Namibia's arable land. The governments of Germany and Britain will finance Namibia's land reform process, as Namibia plans to start expropriating land from white farmers to resettle landless black Namibians. Agreement has been reached on the privatisation of several more enterprises in coming years, with hopes that this will stimulate much needed foreign investment. However, reinvestment of environmentally derived capital has hobbled Namibian per capita income. One of the fastest growing areas of economic development in Namibia is the growth of wildlife conservancies. These conservancies are particularly important to the rural, generally unemployed, population. An aquifer called "Ohangwena II" has been discovered, capable of supplying the 800,000 people in the North for 400 years. Experts estimate that Namibia has 7720 km3 of underground water. Providing 25% of Namibia's revenue, mining is the single most important contributor to the economy. Namibia is the fourth largest exporter of non-fuel minerals in Africa and the world's fourth largest producer of uranium. There has been significant investment in uranium mining and Namibia is set to become the largest exporter of uranium by 2015. Rich alluvial diamond deposits make Namibia a primary source for gem-quality diamonds. While Namibia is known predominantly for its gem diamond and uranium deposits, a number of other minerals are extracted industrially such as lead, tungsten, gold, tin, fluorspar, manganese, marble, copper and zinc. There are offshore gas deposits in the Atlantic Ocean that are planned to be extracted in the future. According to "The Diamond Investigation", a book about the global diamond market, from 1978, De Beers, the largest diamond company, bought most of the Namibian diamonds, and would continue to do so, because "whatever government eventually comes to power they will need this revenue to survive". Domestic supply voltage is 220V AC. Electricity is generated mainly by thermal and hydroelectric power plants. Non-conventional methods of electricity generation also play some role. Encouraged by the rich uranium deposits the Namibian government plans to erect its first nuclear power station by 2018, also uranium enrichment is envisaged to happen locally. Tourism is a major contributor (14.5%) to Namibia's GDP, creating tens of thousands of jobs (18.2% of all employment) directly or indirectly and servicing over a million tourists per year. The country is a prime destination in Africa and is known for ecotourism which features Namibia's extensive wildlife. There are many lodges and reserves to accommodate eco-tourists. Sport hunting is also a large, and growing component of the Namibian economy, accounting for 14% of total tourism in the year 2000, or $19.6 million US dollars, with Namibia boasting numerous species sought after by international sport hunters. In addition, extreme sports such as sandboarding, skydiving and 4x4ing have become popular, and many cities have companies that provide tours. [තහවුරු කරන්න] The most visited places include the capital city of Windhoek, Caprivi Strip, Fish River Canyon, Sossusvlei, the Skeleton Coast Park, Sesriem, Etosha Pan and the coastal towns of Swakopmund, Walvis Bay and Lüderitz. 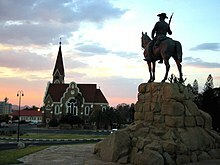 The capital city of Windhoek plays a very important role in Namibia's tourism due to its central location and close proximity to Hosea Kutako International Airport. According to The Namibia Tourism Exit Survey, which was produced by the Millennium Challenge Corporation for the Namibian Directorate of Tourism, 56% of all tourists visiting Namibia during the time period, 2012 – 2013, visited Windhoek. Many of Namibia's tourism related parastatals and governing bodies such as Namibia Wildlife Resorts, Air Namibia and the Namibia Tourism Board as well as Namibia's tourism related trade associations such as the Hospitality Association of Namibia are also all headquartered in Windhoek. There are also a number of notable hotels in Windhoek such as Windhoek Country Club Resort and some international hotel chains also operate in Windhoek, such as Avani Hotels and Resorts and Hilton Hotels and Resorts. Namibia's primary tourism related governing body, the Namibia Tourism Board (NTB), was established by an Act of Parliament: the Namibia Tourism Board Act, 2000 (Act 21 of 2000). Its primary objectives are to regulate the tourism industry and to market Namibia as a tourist destination. There are also a number of trade associations that represent the tourism sector in Namibia, such as the Federation of Namibia Tourism Associations (the umbrella body for all tourism associations in Namibia), the Hospitality Association of Namibia, the Association of Namibian Travel Agents, Car Rental Association of Namibia and the Tour and Safari Association of Namibia. Namibia is the only country in Sub-Saharan Africa to provide water through municipal departments. The only bulk water supplier in Namibia is NamWater, which sells it to the respective municipalities which in turn deliver it through their reticulation networks. In rural areas, the Directorate of Rural Water Supply in the Ministry of Agriculture, Water and Forestry is in charge of drinking water supply. The UN evaluated in 2011 that Namibia has improved its water access network significantly since independence in 1990. A large part of the population can not, however, make use of these resources due to the prohibitively high consumption cost and the long distance between residences and water points in rural areas. As a result, many Namibians prefer the traditional wells over the available water points far away. Compared to the efforts made to improve access to safe water, Namibia is lagging behind in the provision of adequate sanitation. This includes 298 schools that have no toilet facilities. Over 50% of child deaths are related to lack of water, sanitation, or hygiene; 23% are due to diarrhea alone. The UN has identified a "sanitation crisis" in the country. Apart from residences for upper and middle class households, sanitation is insufficient in most residential areas. Private flush toilets are too expensive for virtually all residents in townships due to their water consumption and installation cost. As a result, access to improved sanitation has not increased much since independence: In Namibia's rural areas 13% of the population had more than basic sanitation, up from 8% in 1990. Many of Namibia's inhabitants have to resort to "flying toilets", plastic bags to defecate which after use are flung into the bush. The use of open areas close to residential land to urinate and defecate is very common and has been identified as a major health hazard. නැමීබියාව යනු මොන්ගොලියාවෙන් පසු ඉතා අවම ජනගහනයක් සහිත ස්වයිරී රාජ්‍යයි. නැමීබියා ජනගහනයෙන් වැඩි පිරිස බන්ටු ජාතිකයන්ය.මීට අමතරව ඔවැම්බෝ ජාතිකයන්ද වැඩි ප්‍රතිශතයක් නැමීබියාවේ වාසය කරයී.මොවුන්ගෙන් වැඩි පිරිස උතුරු නැමීබියාවේ වාසය කරති.මීට අමතරව හීරරෝ හිම්බා ධමාරා නාමා යන ජන කොටස්ද නැමීබියාවේ වාසය කරති. In addition to the Bantu majority, there are large groups of Khoisan (such as Nama and San), who are descendants of the original inhabitants of Southern Africa. The country also contains some descendants of refugees from Angola. There are also two smaller groups of people with mixed racial origins, called "Coloureds" and "Basters", who together make up 8.0% (with the Coloureds outnumbering the Basters two to one). There is a large Chinese minority in Namibia. Whites (mainly of Afrikaner, German, British and Portuguese origin) make up between 4.0 and 7.0% of the population. Although their percentage of population is decreasing due to emigration and lower birth rates they still form the second-largest population of European ancestry, both in terms of percentage and actual numbers, in Sub-Saharan Africa (after South Africa). The majority of Namibian whites and nearly all those who are mixed race speak Afrikaans and share similar origins, culture, and religion as the white and coloured populations of South Africa. A large minority of whites (around 30,000) trace their family origins back to the German settlers who colonized Namibia prior to the British confiscation of German lands after World War One, and they maintain German cultural and educational institutions. Nearly all Portuguese settlers came to the country from the former Portuguese colony of Angola. The 1960 census reported 526,004 persons in what was then South-West Africa, including 73,464 whites (14%). Namibia conducts a census every ten years. After independence the first Population and Housing Census was carried out in 1991, further rounds followed in 2001 and 2011. The data collection method is to count every person resident in Namibia on the census reference night, wherever they happen to be. This is called the de facto method. For enumeration purposes the country is demarcated into 4,042 enumeration areas. These areas do not overlap with constituency boundaries to get reliable data for election purposes as well. The 2011 Population and Housing Census counted 2,113,077 inhabitants of Namibia. Between 2001 and 2011 the annual population growth was 1.4%, down from 2.6% in the previous ten–year period. නැමීබියා ජනගහනයෙන් 80%–90% ක්‍රිස්තියානි බැතිමතුන්ය,ඔවුන්ගෙන් 75% ප්‍රොතෙස්තන්ත නිකායට අයත් අතර 50% පමණ දෙනා රෙපෙරමාදු නිකායට අයත්ය. යටත් විජිත බලපෑම නිසා වැඩි දෙනෙක් ක්‍රිස්තියානි බැතිමතුන් වුවද 10%–20% අතර දෙනෙක් අදිවාසීන්ට අයත් ප්‍රාථමික ආගම් අදහති. ක්‍රිස්තියානි මිෂනාරී ක්‍රියාකාරකම් නිසා 19 වන සියවස වනවිට නැමීබියානුවන් වැඩි දෙනෙක් ක්‍රිස්තියානි බැතිමතුන් විය.මේ අතර රෝමානු කතෝලිකයන් මෙතෝදිස්ත යන නිකායන්ට අයත් අයද මේ අතර වෙයි.මොවුන් වැඩි දෙනකුගේ ශාතෘෘ වරයානන් වන්නේ ජේසුස් ක්‍රිස්තුස් වහන්සෛ්ය. නැමීබියාව තුල යුදෙවු ආගමිකයන්ද සුළු පිරිසක් වාසය කරති. නැමීබියාවේ රාජ්‍ය භාෂාව ඉංග්‍රීසි භාෂාව වන අතර ඊට අමතරව ජ්ර්මන් බස අප්‍රිකානු බව ආදී විවිධ භාෂාවන් ව්‍යවහාර වෙයි. Up to 1990, English, German and Afrikaans were official languages. Long before Namibia's independence from South Africa, SWAPO was of the opinion that the country should become officially monolingual, choosing this approach in contrast to that of its neighbour South Africa (which granted all 11 of its major languages official status), which was seen by them as "a deliberate policy of ethnolinguistic fragmentation." Consequently, SWAPO instituted English as the sole official language of Namibia though only about 3% of the population speaks it as a home language. Its implementation is focused on the civil service, education and the broadcasting system. Some other languages have received semi-official recognition by being allowed as medium of instruction in primary schools. It is expected of private schools to follow the same policy as state schools, and "English language" is a compulsory subject. As in other postcolonial African societies, the push for monolingual instruction and policy has resulted in a high rate of school drop-outs and of individuals whose academic competence in any language is low. According to the 2011 census, the most common languages are Oshiwambo (the most spoken language for 49% of households), Nama/Damara (11.3%), Afrikaans (10.4%), Kavango (9%), Otjiherero (9%). The most widely understood and spoken language is English. Both Afrikaans and English are used primarily as a second language reserved for public communication. Most of the white population speaks either German or Afrikaans. Even today, 101 years after the end of the German colonial era, the German language plays a role as a commercial language. Afrikaans is spoken by 60% of the white community, German is spoken by 32%, English is spoken by 7% and Portuguese by 1%. Geographical proximity to Portuguese-speaking Angola explains the relatively high number of Portuguese speakers; in 2011 these were estimated to be 100,000, or 4–5% of the total population. නැම්බියාවේ ජනප්‍රියම ක්‍රීඩාව පාපන්දු ක්‍රීඩාවයි.නැම්බියා ජාතික පාපන්දු කණ්ඩායම ජාත්‍යන්තර වශයෙන් බොහෝ සමත්කම් දක්වා ඇත. නැම්බියානු ජාතික රග්බි කණ්ඩායමද කැපී පෙනෙන දක්ෂතා දැක්වූ කණ්ඩායමකි.ඔවුන් 1999, 2003, 2007, 2011 සහ 2015 වසර වලදී ලෝක කුසලාන තරඟාවලියන්ට සහභාගීවී ඇත.ක්‍රිකට් හා දැල් පන්දු ක්‍රීඩාවන්ද නැම්බියාවේ ජනප්‍රියම ක්‍රීඩා වෙයි. Inline hockey was first played in 1995 and has also become more and more popular in the last years. The Women's inline hockey National Team participated in the 2008 FIRS World Championships. Namibia is the home for one of the toughest footraces in the world, the Namibian ultra marathon. The most famous athlete from Namibia is Frankie Fredericks, sprinter (100 and 200 m). He won four Olympic silver medals (1992, 1996) and also has medals from several World Athletics Championships. He is also known for humanitarian activities in Namibia and beyond. Golfer Trevor Dodds won on the PGA Tour in 1998 (The Greater Greensborough Open) and won 15 tournaments in his career. He achieved a career high world ranking of 78 in 1998. The Swakopmund Skydiving Club in Swakopmund was founded in 1974, and operates still today from Swakopmund Airport. Professional cyclist and Namibian Road Race Champion Dan Craven represented Namibia at the 2016 Summer Olympics in both the road race and individual time trial. Although Namibia's population is fairly small, the country has a diverse choice of media; two TV stations, 19 radio stations (without counting community stations), 5 daily newspapers, several weeklies and special publications compete for the attention of the audience. Additionally, a mentionable amount of foreign media, especially South African, is available. Online media are mostly based on print publication contents. Namibia has a state-owned Press Agency, called NAMPA. The first newspaper in Namibia was the German-language Windhoeker Anzeiger, founded 1898. Radio was introduced in 1969, TV in 1981. During German rule, the newspapers mainly reflected the living reality and the view of the white German-speaking minority. The black majority was ignored or depicted as a threat. During South African rule, the white bias continued, with mentionable influence of the Pretoria government on the "South West African" media system. Independent newspapers were seen as a menace to the existing order, critical journalists threatened. The daily newspapers include the private publications The Namibian (English and other languages), Die Republikein (Afrikaans), Allgemeine Zeitung (German) and Namibian Sun (English) as well as the state-owned New Era (predominantly English). Except for the largest newspaper, The Namibian, which is owned by a trust, the other mentioned private newspapers are part of the Democratic Media Holdings. Other mentionable newspapers are the tabloid Informanté owned by TrustCo, the weekly Windhoek Observer, the weekly Namibia Economist, as well as the regional Namib Times. Current affairs magazines include Insight Namibia, Vision2030 Focus magazine[තහවුරු කරන්න] and Prime FOCUS. Sister Namibia Magazine stands out as the longest running NGO magazine in Namibia, while Namibia Sport is the only national sport magazine. Furthermore, the print market is complemented with party publications, student newspapers and PR publications. The broadcasting sector is dominated by the state-run Namibian Broadcasting Corporation (NBC). The public broadcaster offers a TV station as well as a "National Radio" in English and nine language services in locally spoken languages. The nine private radio stations in the country are mainly English-language channels, except for Radio Omulunga (Oshiwambo) and Kosmos 94.1 (Afrikaans). Privately held One Africa TV has competed with NBC since the 2000s. Media and journalists in Namibia are represented by the Namibian chapter of the Media Institute of Southern Africa and the Editors' Forum of Namibia. An independent media ombudsman was appointed in 2009 to prevent a state-controlled media council. බොහෝ පාසැල් රජය මගින් පාලනයවන රජයේ පාසැල්වන අතර පෞද්ගලික පාසැල්ද තිහිපයක් පවතී.මෙහි විශ්ව විද්‍යාල හතරකින් පමණ ගුරුවරුන් පුහුණු කිරීම සිදුකරයි.කෘෂිකර්මය සදහා විශ්ව විද්‍යාල ආයතන තුනක්ද පොලිස් විශ්ව විද්‍යාලයක් හා තවත් විශ්ව විද්‍යාල දෙකක් පවතී. Life expectancy at birth is estimated to be 52.2 years in 2012 – among the lowest in the world. The AIDS epidemic is a large problem in Namibia. Though its rate of infection is substantially lower than that of its eastern neighbour, Botswana, approximately 13.1% of the adult population is[update] infected with HIV. In 2001, there were an estimated 210,000 people living with HIV/AIDS, and the estimated death toll in 2003 was 16,000. According to the 2011 UNAIDS Report, the epidemic in Namibia "appears to be leveling off." As the HIV/AIDS epidemic has reduced the working-aged population, the number of orphans has increased. It falls to the government to provide education, food, shelter and clothing for these orphans. The malaria problem seems to be compounded by the AIDS epidemic. Research has shown that in Namibia the risk of contracting malaria is 14.5% greater if a person is also infected with HIV. The risk of death from malaria is also raised by approximately 50% with a concurrent HIV infection. Given infection rates this large, as well as a looming malaria problem, it may be very difficult for the government to deal with both the medical and economic impacts of this epidemic. The country had only 598 physicians in 2002. ↑ 3.0 3.1 Spriggs, A. (2001) "Africa: Namibia". ↑ Vedder 1997, p. 177. ↑ Petronella Sibeene (17 April 2009). "Swapo Party Turns 49". New Era. ↑ Tapscott, Chris (January 1994). "Land reform in Namibia: Why not?". Southern African Report. 9 (3): 12. Archived from the original on 24 December 2010. ↑ Udogu, E. Ike (2012). Liberating Namibia. Jefferson, NC: McFarland & Co.. පි. 158. ↑ Brandt, Edgar (21 September 2012). "Land degradation causes poverty". New Era. ↑ Spriggs, A. (2001) "Africa: Namibia". ↑ Spriggs, A. (2001) "Southern Africa: including parts of Botswana, northeastern Namibia, Zimbabwe, and northern South Africa". ↑ "Paper and digital Climate Section". ↑ Olszewski, John (13 May 2009). "Climate change forces us to recognise new normals". Namibia Economist. Archived from the original on 13 May 2011. ↑ Olszewski, John (25 June 2010). "Understanding Weather – not predicting it". Namibia Economist. Archived from the original on 7 December 2010. ↑ Adams, Gerry (15 April 2011). "Debilitating floods hit northern and central Namibia". United Nations Radio. ↑ van den Bosch, Servaas (29 March 2011). "Heaviest floods ever in Namibia". The Namibian. ↑ Community Based Natural Resource Management (CBNRM) Programme Details (n.d.
↑ Shugart, Matthew Søberg (September 2005). ↑ Shugart, Matthew Søberg (December 2005). ↑ Shivute, Peter (2008). "Foreword". මෙම කෘතිය තුල: Bösl, Anton; Horn, Nico (PDF). The Independence of the Judiciary in Namibia. Publications sponsored by Konrad Adenauer Stiftung. Macmillan Education Namibia. පි. 10. ISBN 978-99916-0-807-5. http://www.kas.de/wf/doc/kas_15058-544-2-30.pdf. ↑ Hopwood, Graham (February 2012). "Flying high". insight Namibia. ↑ Nakale, Albertina Haindongo (9 August 2013). "President divides Kavango into two". New Era. via allafrica.com. Archived from the original on 21 December 2015. ↑ Duddy, Jo-Mare (4 February 2010) "Half of all Namibians unemployed". ↑ Ndjebela, Toivo (18 November 2011). "Mwinga speaks out on his findings". New Era. ↑ Mongudhi, Tileni (3 February 2010 ) "Tender Board tightens rules to protect jobs". ↑ 69.0 69.1 World Almanac. 2004. ↑ Weidlich, Brigitte (7 January 2011). "Uranium: Saving or sinking Namibia?". The Namibian. Archived from the original on 13 January 2011. ↑ Hartman, Adam (30 September 2009). "Tourism in good shape – Minister". The Namibian. ↑ 89.0 89.1 89.2 89.3 Banerjee, Sudeshna (2009). Ebbing Water, Surging Deficits: Urban Water Supply in Sub-Saharan Africa. Washington, DC: The International Bank for Reconstruction and Development / The World Bank. http://www.infrastructureafrica.org/aicd/system/files/BP12_Water_sect_maintxt_new.pdf. ↑ 90.0 90.1 Smith, Jana–Mari (12 July 2011). "Red alert on sanitation and safe drinking water". The Namibian. ↑ "Independent UN expert urges Namibia to expand access to sanitation services". UN News Centre. United Nations News service. 11 July 2011. ↑ 92.0 92.1 Tjihenuna, Theresia (2 April 2014). "More than 1 million Namibians defecate in open". The Namibian. ↑ Cloete, Luqman (28 April 2008). "Namibia is lagging behind on sanitation". The Namibian. ↑ Deffner, Jutta; Mazambani, Clarence (September 2010). "Participatory empirical research on water and sanitation demand in central northern Namibia: A method for technology development with a user perspective" (PDF). CuveWaters Papers. Frankfurt (Main): Institute for Social-Ecological Research (ISOE). 7. ↑ Singh, Lalita Prasad (1980). The United Nations and Namibia. East African Publishing House. ↑ Kapitako, Alvine (8 August 2011). "Namibia: 2011 Census Officially Launched". New Era. via allafrica.com. ↑ 103.0 103.1 Duddy, Jo Maré (28 March 2013). "Census gives snapshot of Namibia's population". The Namibian. ↑ Pütz, Martin (1995) "Official Monolingualism in Africa: A sociolinguistic assessment of linguistic and cultural pluralism in Africa", p. 155 in Discrimination through language in Africa? ↑ 106.0 106.1 Kriger, Robert & Ethel (1996). Afrikaans Literature: Recollection, Redefinition, Restitution.. Rodopi Bv Editions. පිටු 66–67. ISBN 9042000511. ↑ Press Freedom Index 2010 – Reporters Without Borders. Vedder, Heinrich (1997) (Germanයෙන්). Das alte Südwestafrika. Südwestafrikas Geschichte bis zum Tode Mahareros 1890 [The old South-West Africa. South-West Africa's history until Maharero's death 1890] (7th සංස්.). Windhoek: Namibia Scientific Society. ISBN 0-949995-33-9. Olusoga, David; Erichsen, Casper W. (2010). The Kaiser’s Holocaust: Germany’s Forgotten Genocide. London: Farber and Farber. ISBN 978-0-571-23142-3. මේ පිටුව අන්තිමට සැකසුවේ 11 නොවැම්බර් 2017 දින දී, 06:23 වේලාවෙහිදීය.